I decided to make some changes to address this. First all of the through tenons were made into split tenons. 3″ wide on the main case and 2.5″ wide on the side pods. Between the twin tenons is a 3/8″ long stub tenon that fits into a groove in the case sides. On the opposite side of the through tenons there is just a wide stub tenon and matching dado in the inner case side. This means less of the sides is removed for the joinery. I’m on the fence about whether 3/8″ is long enough for the stub tenon on the sides without a though tenon. Maybe that should be a half inch or even 5/8″? It’s a balance I guess, between glue surface and side strength. My gut feel is to increase in on the inner sides to a half inch. 3/8″ stub tenons join to the inner case sides. The same from the long shelves into the sides. I also made the back splashes taller, I like that better than the shorter version. And I removed the through tenons on those parts. I don’t think it added anything visually, and it’s one less visible joint that could show problems. So, here is the second version. It’s better I think. The back splashes might be a tiny bit too tall, but I could go either way. I’m concerned about the strength of the stub tenons into the case sides — in particular the short side shelves into the center case sides. There isn’t much glue area there, and it’s mostly end grain on one side of the joint. I might need to think about that a little more. I could make it deeper, maybe with twin tenons that went quite deep into the sides. I could thing about a sliding dovetail joint (but that seems like it would really complicate matters). I’m open to suggestions on that joint. Pocket screws? (kidding). 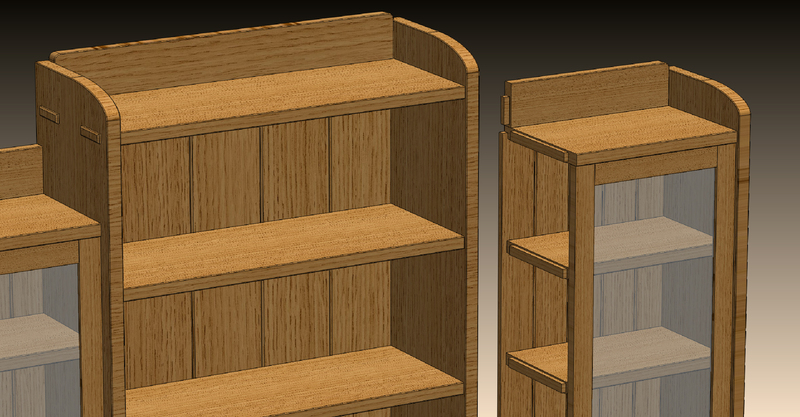 The more I think about it, the more I’m convincing myself that I should change the joinery once more. 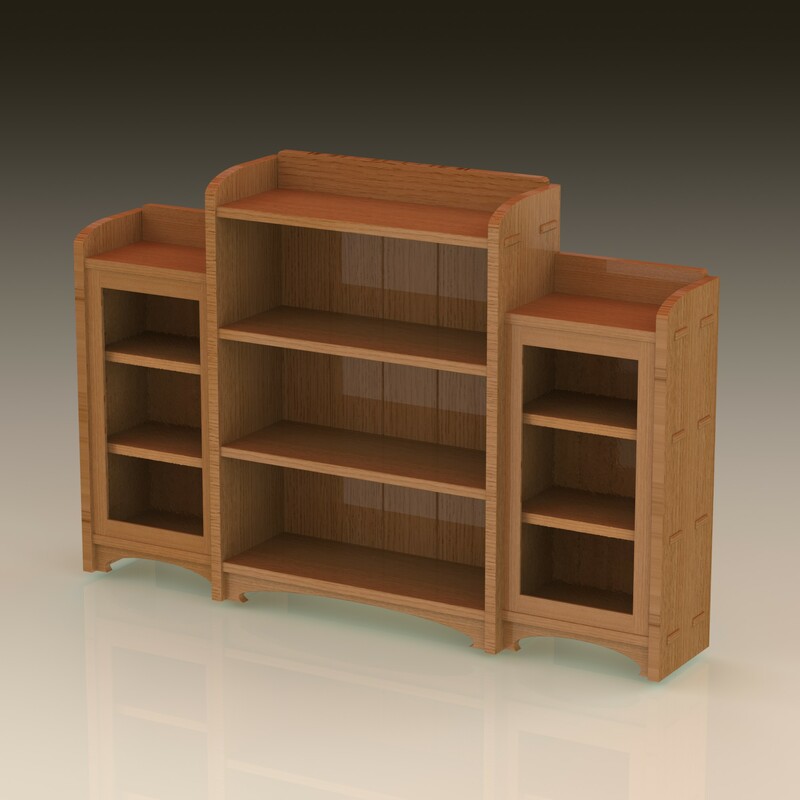 Through tenons on the top and bottom shelves, and sliding dovetails on the middle two shelves in each unit. That will lock the units together mechanically and there won’t be any reliance on glue strength for the overall structural integrity of the piece. 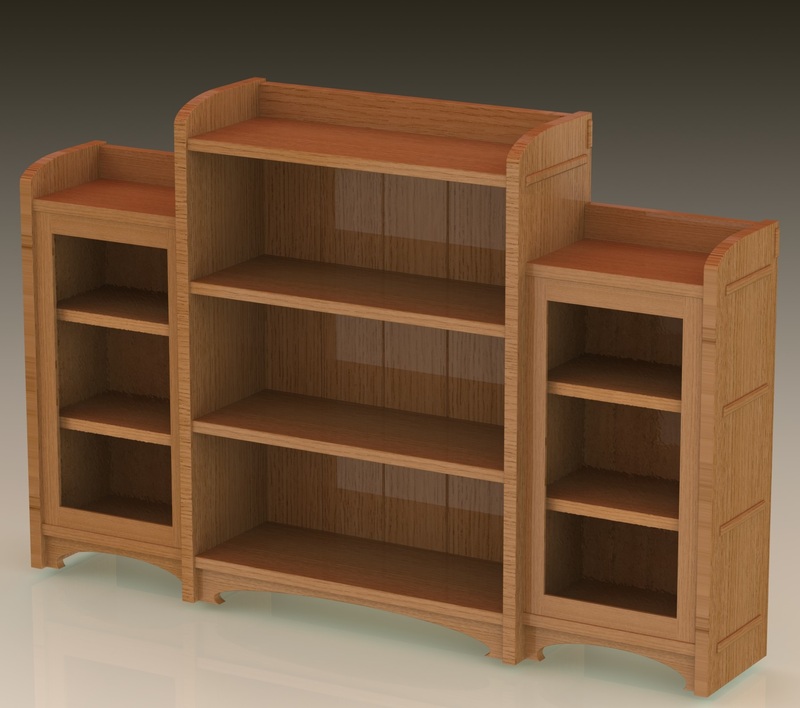 Nice looking bookcase. I really like the simple, clean lines. Out of interest, what software do you use for modelling your projects? Hi George, I use SolidWorks. It’s an expensive, fairly high-end package but I have a license for it left over from a business I had in the past where I was designing and manufacturing motorcycle parts. It’s got a couple of features that make it a lot more flexible and productive than other packages I’ve tried. I used Alibre previously, and it had similar features as was quite a bit cheaper with similar features. I’ve played with SketchUp, and it can do the job too, but I find it really awkward to use, especially going through design changes. Have you given any thoughts to rounding (making a hump) the back splashes? I’ve got two or three ideas I want to try out for the backsplash still. An arched top profile, possibly a cutout design and an inlay design. I was looking through Bob Lang’s book on “Craftsman Inlay” last night trying to find an interesting pattern that I could adapt. I’m going to change the joinery to incorporate sliding dovetails for better strength, play with some ideas for the backsplash shapes and change the doors next. I agree with Ralph, think about connecting the look of the top, the back splash, with the bottom. I like the over all look as is but a slightly different treatment of the top could make it sing. The twin through tenons greatly improve the look of the piece, as well as it’s structural integrity. 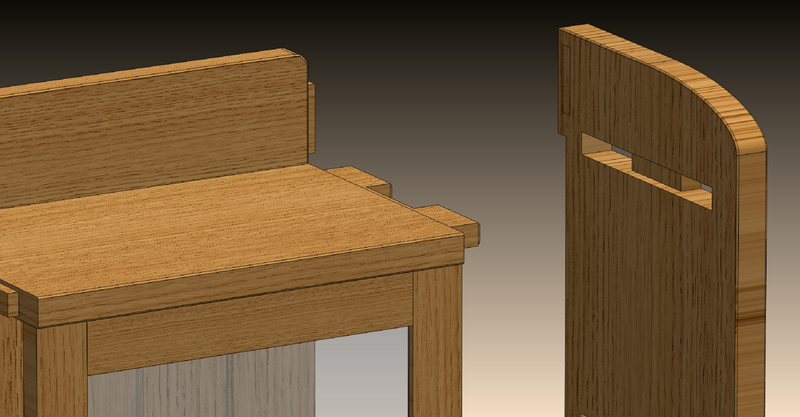 Using sliding dovetails on the hidden joints would move it into the realm of indestructibility. Have you considered a cloud lift treatment for the back splash, tops of the case sides and aprons? I’ve used them (I think successfully) on A&C magazine racks. There’s no need to go “whole hog” G&G, but I think it would be an improvement over the sterility of typical Stickley designs.